SEO Content length — does size matter? When pondering the ideal length of SEO content, should you aim for short and sweet or take the ‘supersize’ approach? Frankly, length matters. When it comes to search engine rankings, you’re as likely to find 300-word articles in Google’s Top Ten as pieces that stretch to well over 2,000 words. However, with thousands of businesses competing for better visibility, it’s certainly worth taking a closer look at the role length plays in SEO copywriting. The text type often determines the optimum length of a piece, and, ultimately, content quality is always the most critical factor. Why are longer blog posts ranking better? What ranking factors should you take into consideration when determining content length? How does user intent factor into the content length debate? User intent – how can it vary? Does mobile-first indexing play a role in determining SEO blog post length? What about landing page copywriting? What length is suggested for product description copywriting? 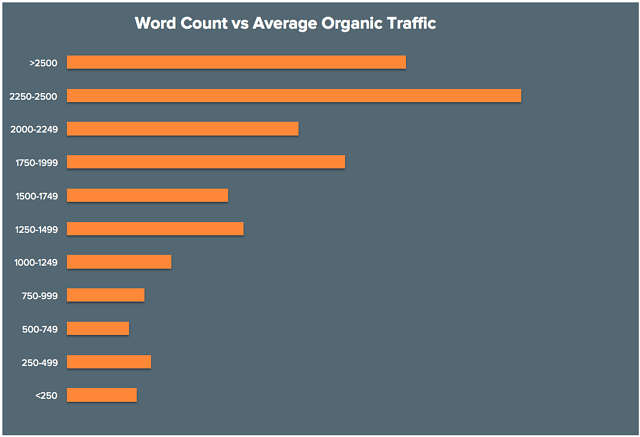 Just a few years ago, some SEO experts claimed that blog posts should be about 250 words long. Unbelievably, some thought that texts of 250 words were on the long side. Today, 1,500 to 5,000 words is the norm, and a blog post that’s under 300 words is likely to be perceived as “thin content”. The Google Top Ten is now frequently dominated by articles of 2,000 words or more. Simply put, longer content produces higher rankings, as a study jointly produced by Ork Dork and Buzz Sumo so aptly illustrates. Longer content gets more shares and backlinks, and pieces in the 3,000 to 10,000 range perform consistently well. Longer posts are popular for many reasons: they tend to provide more information and appear to be more useful or relevant. Ten years ago, Google was less advanced, and there was no need to publish longer pages as the algorithm wasn’t equipped to understand editorial content, meaning it was easier to manipulate SERP (search engine results pages) rankings. Longer blog posts are also more likely to lead to social shares, again influencing ranking factors and leading to higher placement. A recent study by Moz and Buzz Sumo analysed 1 million websites in their search for the optimal content length for SEO. They concluded that 85% of online content was below the 1,000-word count. Therefore, if you want your blogging content to go viral, you should be aiming for longer posts of at least 2,000 words. As a website manager, your aims are probably fairly clear. You want to rank higher and see an increase in organic traffic, which then translates to leads and sales. According to recent research, volume generated from organic searches to URLs is significantly higher when posts are longer. The optimum post length for SEO appears to be from 2,250 to 2,500 words. You also want to see your posts shared and backlinked as much as possible. Longer posts are more likely to generate quality backlinks which, in turn, affect ranking factors. This handy graph from Hubspot perfectly illustrates the relationship between ideal content length and backlinks. That’s not to say that shorter content doesn’t have its place. While 1,000 to 3,000 words is a good length for a blog post, the same doesn’t apply when users are searching for fast answers to specific enquiries. In addition, short texts of between 300 and 500 words are the ideal length for landing pages or category descriptions, for example, and you can link them to more detailed longer pieces where relevant. Writers should aim for quality as much as quantity, addressing factors like user intent. These days, Google invariably places higher quality SEO content at the top of its rankings. The search engine aims to provide users with the best results and has reached the logical conclusion that longer blog posts are more valuable and more likely to answer a reader’s questions. In SEO, user intent is viewed as even more important than keywords. While a specific keyword defines the primary subject matter, user intent speaks to the type and length of the content itself. For example, someone searching for information on today’s weather will generally find that search results with under 300 words are sufficient to satisfy their needs. However, when a website user wants more information, the optimal blog post length for SEO is likely to exceed 1,000 words. Algorithms like Google’s Hummingbird are committed to understanding user intent and the reasoning behind specific searches. User intent can be looked at most easily as two main categories and two subcategories, and doing so will enable you to find the optimal blog post length more easily. These categories define whether 1) a user is looking for specific information relating to a keyword or 2) they want more general information on a subject. The main two categories can then be split according to a) how specific the user is – specific users tend to have narrower search parameters and are less likely to deviate from a keyword or topic – and b) how exhaustive the user is – exhaustive users are more inclined to branch out and look for more information regarding specific topics. The mobile-first index is fast becoming one of the more important elements in SEO ranking as Google strives for ways to address current user trends and make the internet more mobile friendly. The basic premise is that your mobile site becomes Google’s starting point when determining ranking. Although called the mobile-first index, that doesn’t mean that it’s mobile-only since desktop versions will still appear on searches when a mobile version isn’t available. Sites which offer a better experience for mobile devices are ranked higher, but the optimal blog length for SEO tends to be somewhat shorter. That’s because shorter pieces are easier to read when you’re using a smartphone or tablet. Google recognises the value of SEO optimised mobile-friendly content and rewards it with higher rankings. While studies show that longer articles (1,500+ words) get more shares, it is generally thought that shorter landing page texts are the most effective. Keywords and keyword variations should be spaced evenly throughout the page for natural readability, and although users may initially search for just a couple of words, your SEO content should be rich and informative. If you want to have your content rated as a “rich answer” or are trying to create text that’s optimised for long-tail keyword phrases, a shorter and more focused landing page text may be preferable. Depending on the product, most people agree that shorter is better. You might find yourself dealing with a product that needs at least 750 words to do it justice. However, in the case of a pair of jeans, for example, a few well-chosen sentences, or 75-150 words, is considered adequate. Whether you’re describing a range of washing machines in 300 words or gushing about a selection of the latest luxury cars in 2,000, a good category page will contain detailed information that helps buyers connect with your company’s products or services. A category description should include relevant keywords and links, yet its length will have no real impact on Google positioning. The length of destination guides or descriptions can differ dramatically depending on the goals of the piece. However, longer travel articles are more likely to be shared – especially if the reader feels that they have learned something from each sentence. To summarise, SEO content length is undoubtedly a factor today, but it’s always less important than posting quality content that offers readers something of value. Because Google searchers can recognise the main indicators of user experience, great content written by a reliable copywriting agency will give you an advantage. Plus, when you create good evergreen content, you can add to it and further increase your rankings, as we’ve done with this original piece. Now that you know even more about the importance of quality, well-crafted editorial content, order a text from our expert SEO content production team at greatcontent.